Takao to Challenge Iyama for Honinbo Title: Four years after being deposed as Honinbo, Takao Shinji 9P has earned a chance to regain the title, but to succeed he will have to overcome his nemesis, Iyama Yuta. The 68th Honinbo League ended on April 8 with the grand finale that has become customary for leagues in recent years, with all the games in the final round being held on the same day. By this stage only two results at the top were possible, a win for Takao (right) or a play-off between him and Cho U. Takao avoided complications by defeating his final-round opponent, Imamura Toshiya 9P. As it turned out, Cho U lost his game with Yamashita Keigo Meijin, so Takao could have afforded to drop his game. Full results in this round and final placings follow. 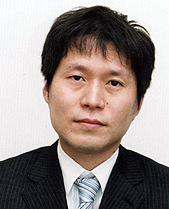 Takao Shinji 9P (W) defeated Imamura Toshiya 9P by resignation; Yamashita Keigo Meijin (W) d. Cho U 9P by resignation; Ko Iso 8P (B) d. Cho Sonjin 9P by resignation; Yuki Satoshi 9P (W) d. Seto Taiki 7P by resignation. 1. Takao Shinji: 7-0; 2. Yamashita Keigo: 5-2; 3. Cho U: 5-2; 4. Yuki Satoshi: 3-4. Ko Iso: 3-4; Imamura Toshiya, Seto Taiki: 2-5; Cho Sonjin: 1-6. The last four players lost their places in the league. The title match will get off to a start on May 16 and, if it goes the full distance, continue until July 18. 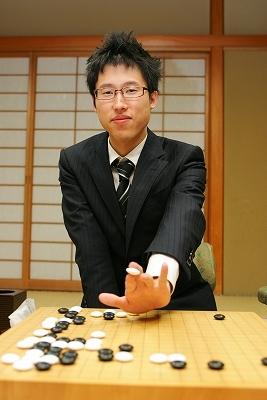 Iyama Yuta will be the favorite, as he has a 17-5 lead over Takao, but Takao won their most recent encounter, in the Meijin League in January. They have played one previous title match, when Takao challenged Iyama for the 35th Meijin title in 2010; Iyama won this match 4-0. Iyama and Hane Keep Chances Alive in Meijin League: Cho U 9P, on 4-0, is the only undefeated player in the 38th Meijin League, but his main rivals, Hane Naoki 9P (left) and Iyama Yuta Kisei (right), who each have only one loss, both won their fifth-round games, played on April 11, so they are keeping up the pressure on Cho. Iyama (W) beat Murakawa Daisuke 7P by resignation and Hane (B) beat Yuki Satoshi 9P, also by resignation. The latter game put an end to Yuki’s recent winning streak, but actually it’s more serious than that: Yuki seems unable to win in the Meijin League. In the previous league, he lost all eight games and the last two in the league before that; he has now lost four in a row in the current league, so he has lost 14 games in a row. This is surely one of the worst losing streaks ever in a league (one reason being that probably not many players who have scored 0-8 have won a place in the next league). Xie and Kobayashi Win Pair Go: The team of Xie Yimin, holder of the Women’s Triple Crown, and Kobayashi Satoru 9P defeated Osawa Narumi 4-dan and Mizokami Tomochika 8-dan in the final of the Professional Pair Go Championship 2013. The game was played on March 10 and telecast on March 31. This is the fourth year in a row Xie has been on the winning team and fittingly she made a big contribution to her team’s victory this year with a very aggressive clamping move in the middle game that gave her team control of the game. 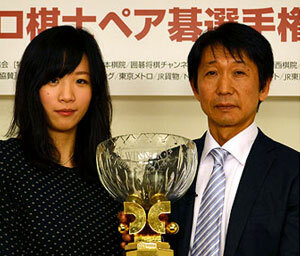 Details of the tournament are given on the homepage of the Japan Pair Go Association. Korea wins 3rd Huang Longshi Cup: This is a knock-out team tournament for five-player female teams from China, Korea, and Japan, run along the lines of the Nong Shim Cup and sponsored by the City of Jiangyan in Jiangsu Province in China. It is named after Huang Longshi, active in the second half of the 17th century, who was one of the greatest Chinese players of the historical period. After Korea’s first player, Kim Cae-yeong 1-dan, started with four successive wins, the tournament was dominated by the fifteen-year-old Yu Zhiying 2-dan (right), who won six games in a row. She was finally beaten by the sixteen-year-old Ch’oe Cheong 2-dan of Korea, who won three games in a row, securing victory for Korea (the final game was played on April 11). The services of Korea’s top board, Pak Chi-eun 9-dan, were not required. 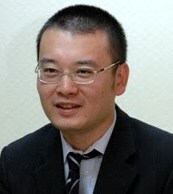 The Japanese team, headed by Xie Yimin 6-dan, was unable to win a game. Actually only three of the fifteen players put a win on the board. 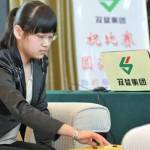 Last year, a 20-year-old from China, Wang Chenxing 2-dan, was the star, winning eight games in a row. Every year the players are getting younger. A Good Week for Yuki: The last week of March was undoubtedly one of the best of Yuki Satoshi 9P’s care er. On the 23rd, Yuki (right), the top player of the Kansai Ki-in, defeated Takao Shinji 9P in the final of the 8th Daiwa Securities Cup. Taking black, Yuki won by 3.5 points. As of this term, the Daiwa Cup, a tournament played on the internet, was upgraded to an official title, which means two things. First, it was opened to participation by Kansai Ki-in professionals, which gave Yuki his chance. Second, it is now included in the tallies of official titles won by a player. Just for the record, Yuki’s predecessors (in order) are Takao, O Meien, Takao again, Kono Rin for the 4th and 5th cups, and Iyama Yuta for the 6th and 7th (none of these players can include the cup in their official tallies; that makes a difference, especially for someone like Iyama, who, on present form, can be expected to challenge Cho Chikun’s all-time record of 72 titles). First prize is 3 million yen (about $32,000). The next day, Sunday the 24th, the final of the 60th NHK Cup was telecast on NHK educational TV. Taking white, Yuki defeated Iyama Yuta by 9.5 points to win the NHK Cup for the fourth time and twice in a row for the second time. This game would actually have been played a week or two before telecasting. Yuki’s win put an end to a losing streak against Iyama of ten games in a row.His last previous win was in the final of the same tournament in 2010, when he won this title for the first time. Ironically, Iyama had enjoyed much better form in the NHK Cup up to the final, scoring decisive wins over Komatsu Hideki 9P, Mizokami Tomochika 8P, Hane Naoki 9P, and Kono Rin 9P. In contrast, Yuki struggled, almost losing to Kurahashi Masayuki 9P before he pulled off an upset, beating Akiyama Jiro 8P by half a point, and then needing all his patience to prevail in tough games with Murakawa Daisuke 7P and Yamada Kimio 9P. Yuki dominated the final however, as Iyama chose a slightly unreasonable variation early in the game and got a bad result; he admitted later that he wasn’t really in the game after his opening setback. Both players will represent Japan in the TV Asia tournament, usually played towards the end of spring. Yuki’s third success was his win in the second game of the 51st Judan title match on the 28th. This evened the series and kept alive his chances of taking his second top-seven title. The game was played in Tamana City in Kumamoto Prefecture. Taking white, Yuki won by 2.5 points. The third game will be played on 4 April. Takao takes sole lead in Honinbo League: After the first five rounds, only two players were left undefeated in the 68th Honinbo League: Takao Shinji 9P (at left) and Cho U 9P, who are both former Honinbos. The winner of their 6th-round clash, held on March 27, would take a big step towards becoming the challenger to Iyama Yuta Honinbo. Both sides played very fast for such an important game. Cho, in particular, took almost no time on his moves. He seemed to make the better start, but in the middle game Takao made a skilful sacrifice, then took advantage of his superiority in ko threats to start a ko fight that clinched the game. 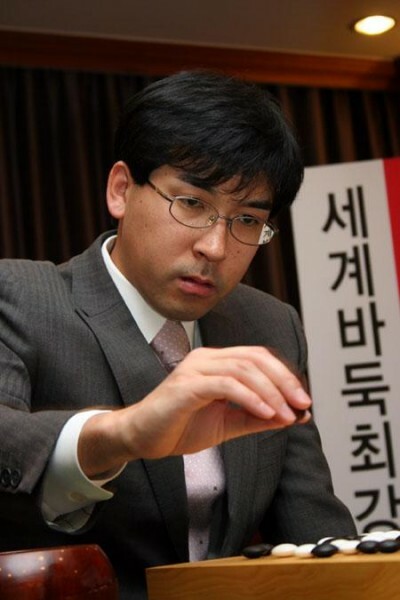 In the end, Cho, who played black, had to resign. 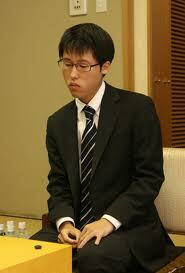 In the final round, Takao plays Imamura Toshiya 9P, who is on 2-4, and Cho plays Yamashita Keigo 9P, who is on 4-2. Whatever happens, Takao will at least make a play-off. 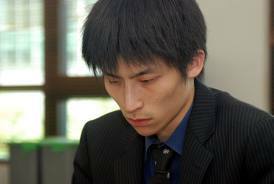 Gu Li Wins Agon Kiriyama Cup Play-off: Cho U played his Honinbo League game on a Wednesday instead of the usual Thursday because he had to play the 14th Agon Kiriyama Cup Japan-China play-off on Saturday, March 30. The extra rest day didn’t help: for the 10th year in a row China won this play-off. This year it was Japan’s turn to host the play-off. The last international event held in Japan, the International Amateur Pair Go Championship in November 2012, was boycotted by China to show their displeasure with the Japanese government’s nationalization of the Senkaku Islands, but fortunately Gu Li (right) turned up for this game. Taking white, he won by 4.5 points to score his fourth victory in the play-off. After winning the first four play-offs, Japan has been outclassed in this play-off. 38th Kisei Leagues: The four vacant seats in the upcoming Kisei Leagues have been decided. They have gone to Yamashiro Hiroshi 9P (making an immediate comeback after being eliminated in the previous league), 25th Honinbo Cho Chikun, Kiyonari Tetsuya 9P, and Murakawa Daisuke 7P. Murakawa, the top player of his age group at the Kansai Ki-in (he is 23), is making his debut in a league. Kiyonari, also from the Kansai Ki-in is playing in his second Kisei league. Longtime go writer John Power is a veteran author, translator and compiler of go books and magazines.